Sent stamp application to Liberal Government. Passed application onto the Chairperson of the Stamp Advisory Committee – Request was denied. After the previous year’s rejection. President Carl Kovacs had 500 stamps printed via a “Build your own stamp” promotion through Canada Post. Theses stamps were used on all of the Foundation mail outs for that year. These were quite well received. With the advice and support from St. Catharines M.P. Rick Dykstra and Niagara West-Glanbrook M.P. Dean Allison stamp packages were created and distributed to local government officials, provincial government officials, party leaders and the Prime Minister himself. Included in the stamp package is an image created by one of our board members. As Seen Below. We refocused our efforts to having a stamp of Fergie to coincide with Black History Month, which is February in Canada and the US. Packages were sent. Letters of support came flooding in. We received a letter of recognition from the Right Honourable Stephen Harper stating (via his office) that we have his support and that the letter would re-directed to the appropriate place. We receive notice that Fergie will not be represented on a postage stamp in 2010 / 2011. Rather, stamps depicting the Olympics, Girl Guides of Canada and the African Violetwill be. Received an email from Canada Post Stamp Program Development office stating that the Fergie Jenkins stamp idea had been resurrected and put on a short list of potential ideas for 2011 and more information would be provided to us after their annual meeting in March of 2010. Hooray. 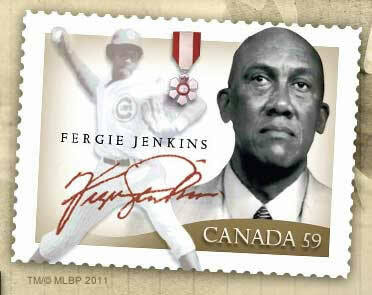 It is announced April 28, 2010 in a media release that Ferguson Jenkins will be immortalized on a Canadian Postage Stamp in February 2011. See abbreviated media release below. Hall of Fame, Walk of Fame, Hydroplane – 2011 stamp program has something for everyone! As part of Black History Month, two stamps pay tribute to Canadian baseball Hall-of-Famer and youth advocate Fergie Jenkins, and journalist Carrie Best, founder of The Clarion, the first black-owned newspaper published in Nova Scotia.